Peeves was a poltergeist at Hogwarts School of Witchcraft and Wizardry, since c. 993. Fond of mischief and chaos, he was a constant pain to the school and its inhabitants, especially Argus Filch, the caretaker, as the only ones able to control him were the Bloody Baron and Albus Dumbledore. In 1995, Peeves, along with most of the Hogwarts residents, opposed Dolores Umbridge, the High Inquisitor, and pranked her until she was kicked out of the school at the end of the school year. In 1998, Peeves fought at the Battle of Hogwarts against Lord Voldemort and his Death Eaters. After the Second Wizarding War, Peeves continued making trouble at Hogwarts. Peeves has lived at Hogwarts Castle since its founding in c. 993. He "came with the building", and came into existence with the founding of an institution containing a large number of children. Peeves has wrought havoc upon Hogwarts for centuries, and was often the cause of ire for various teachers and staff. Starting with Hankerton Humble, who was appointed by the Founders themselves, Peeves has traditionally been a pet peeve of every caretaker the school has seen. In 1876, caretaker Rancorous Carpe devised an "elaborate trap" in an effort to remove Peeves from the Castle. The trap was comprised of a bait of assortment of weapons and a vast enchanted bell jar, reinforced by various Containment Charms, which he intended to drop over the poltergeist once he was in place. This did not go as planned, as Peeves easily broke through the bell jar and was left armed with several cutlasses, crossbows, a blunderbuss and a miniature cannon. The Castle had to be evacuated for three days as Peeves amused himself by firing randomly and threatening the students with death. Professor Eupraxia Mole, Headmistress of the day, agreed to sign a contract with Peeves, so that he relinquished the weapons in exchange for additional privileges (a once-weekly swim in the boys' toilets on the ground floor, first refusal on stale bread from the kitchen for throwing purposes, and a new custom-made hat by Madame Bonhabille). This was the last and most disastrous attempt to get rid of Peeves. These events forced Mr. Carpe to take early retirement "for health reasons". Peeves was a topic of discussion before the Start-of-Term Feast of 1991. Hogwarts' ghosts debated whether or not Peeves should be allowed to attend the feast. While the Fat Friar was willing to give Peeves another chance, Nearly Headless Nick felt Peeves did not deserve to be even considered; ghosts had been given a bad name because of him. After the Start-of-Term Feast, Peeves appeared to torment prefect Percy Weasley as he led the Gryffindor first years to Gryffindor Tower. Peeves threw walking sticks at the prefect, disregarded Percy's threat to tell the Bloody Baron, responded by blowing a raspberry, dumped even more walking sticks onto Neville Longbottom's head and left.Peeves wrote rude words on a classroom blackboard when Professor McGonagall surprised Harry with the position of Gryffindor Seeker. Later in the year, Peeves caught Harry Potter, Hermione Granger, Ron Weasley, and Neville Longbottom sneaking around the school after curfew. He teased them and then loudly alerted Filch to their presence in the halls. However, once Filch arrived, Peeves did nothing but antagonise him. In October, Ron suspected Peeves to have been the one who released the troll but in truth, it turned out that Professor Quirrell had done it. Harry, Ron and Hermione once again encountered Peeves in the hallways during their quest to save the Philosopher's Stone. Without Peeves' knowledge, the three of them were concealed under Harry's Invisibility Cloak from which Harry impersonated the Bloody Baron, warning Peeves to stay away from the third floor that night. In the autumn of 1992, Peeves crashed a vanishing cabinet over Filch's office, after being persuaded by Nearly Headless Nick, saving Harry from one of Filch's punishments. Wearing a bright orange party hat and a revolving bow tie, Peeves attended Nearly-Headless Nick's deathday party, where he appeared to be civilised, even though he taunted Hermione Granger for gossiping about Moaning Myrtle. He later pelted mouldy peanuts at Myrtle, mocking her spots. Some time later, Peeves appeared in a hallway with Harry, where he noticed the two new basilisk victims, Justin Finch-Fletchley and Nearly Headless Nick. He loudly alerted the faculty and students of Hogwarts of the attack. He performed a song to taunt Harry over the fact that students though he was the one releasing Slytherin's monster and petrifying the muggle-born students. Peeves soon added a dance routine for the song. In 1993, Peeves appeared before Remus Lupin and his third year Defence Against the Dark Arts class when they were entering the teacher's lounge for a practical lesson. Peeves stuffed a keyhole with chewing gum when he noticed Remus. He began singing the phrase "Looney, loopy Lupin" over and over again. Professor Lupin asked him to remove the gum, but Peeves' only response was a loud raspberry. To this, Remus cast a simple spell, Waddiwasi, which shot the gum up Peeves' nose. On 31 October, Peeves informed Professor Dumbledore of the Fat Lady's location after her portrait was attacked. He also revealed that her attacker was the escaped prisoner, Sirius Black. At half past four in the morning, Peeves woke Harry Potter up by blowing in his ear, disregarding the fact that the Gryffindor versus Hufflepuff Quidditch match was to be that day. Peeves was shown on the Marauder's Map to entertain himself by bouncing around the trophy room. He also displayed quite an amount of glee at the prospect of the Dementors using the "Kiss" on Sirius Black. His first appearance was before the welcoming feast in the entrance hall, where he dropped water balloons on the students. During the feast, Gryffindor ghost Nearly Headless Nick stated that Peeves was enraged at being unable to attend the feast, as decided via ghost's council, and therefore had caused havoc and mayhem in the kitchens, terrorising the house-elves. When Harry was practising the Summoning Charm with Hermione, Peeves appeared and started chucking chairs across the room under the pretence that Harry wanted things thrown at him. Around the time of the Yule Ball, Peeves frequently hid in a suit of armour and sang rude songs and was also accused of stealing Harry's golden egg the night Harry worked out the clue. Peeves was in the classroom where Harry, Ron and Hermione were situated shortly after conversing with Sirius about forming Dumbledore's Army. He threw ink pellets at the trio and others, including Katie Bell, who he emptied an ink bottle over. Peeves was not completely without loyalties, though; during Dolores Umbridge's attempts to take control of Hogwarts in 1996, he showed respect for his fellow troublemakers, Fred and George Weasley. Taking their words to heart as they fled the school, this marked possibly the only time Peeves knowingly obeyed a student. After the Weasley twins' departure, Peeves began a rampage of ceaseless mayhem by juggling burning torches over the students, dumping a bag of tarantulas onto the Great Hall, and destroying property like never before. It appears that Peeves was actually on friendly terms with the strict Professor McGonagall during this time, due to Umbridge. Professor McGonagall went as far as telling him he was unscrewing the chandelier the wrong way, and apparently she later allowed him to borrow her walking stick to hit Dolores as she fled from Hogwarts. When Harry asked Luna Lovegood to attend Professor Slughorn's party, Peeves overheard and started singing a song of his own composition describing the situation. Shortly after the Apparation lessons, Peeves blocked a door to the Gryffindor Common Room, and wouldn't let anyone pass unless they set fire to their own pants. Only Neville Longbottom fell prey to this prank. During 1996, when Harry Potter was admitted to the hospital wing after suffering a cracked skull when Cormac McLaggen hit him with a bludger, Harry summoned Kreacher to have him tail Draco Malfoy around the castle. Kreacher apparated there along with Dobby, with whom he was fighting after Kreacher insulted Harry Potter. A moment later Peeves apparated, saying that he was watching the fight. Then Peeves egged them on verbally, then throwing chalk at them to enrage them further. He only left when Harry used Langlock to glue Peeves' tongue to the roof of his mouth. In April 1997, after attending the burial of Aragog and getting an important memory from Horace Slughorn, Harry Potter could feel the effects of Felix Felicis wearing off as he escaped back into the castle. He encountered Peeves, but managed to escape detection by taking a shortcut. It is unknown if Peeves attended Dumbledore's funeral. During the Battle of Hogwarts in 1998, Filch (albeit forcibly and only after he was persuaded by Minerva McGonagall) invited Peeves to take part in the defence of the castle. Peeves delightedly caused chaos among the Death Eaters by dropping Snargaluff pods on them. After the battle, he was heard singing a victory song to celebrate winning the battle. Unlike the overwhelming majority of his colleagues, Peeves has a physical form, though he was able to become invisible at will. 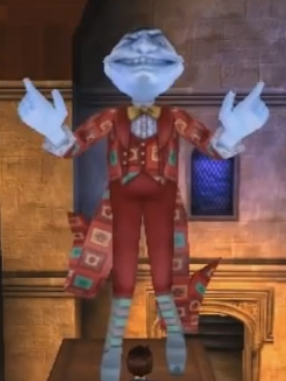 Peeves appears like a little man with wickedly slanted, orange eyes, dressed in loud, outlandish clothes including a bell-covered hat and an orange bow tie. He had black hair and compared to the Hogwarts ghosts, he was solid-looking, not pearly white and transparent. He was capable of flight and intangibility, like a ghost, but could also affect solid objects and make himself invisible. Peeves: "Why, it's Potty Wee Potter!" Harry Potter: "Get out of it, Peeves." Peeves: "Oooh, Crackpot's feeling cranky. What is it this time, my fine Potty friend? Hearing voices? Seeing visions? Speaking in --- tongues?" Peeves was the most notorious and troublesome poltergeist in British history. His looks were said to reflect his nature, which "those who know him would agree was a seamless blend of humour and malice". Peeves was more of a chaotic spirit rather than a physical being, but highly different from the other school ghosts. Peeves was essentially an embodiment of disorder, and took great pleasure in constantly causing it. At times, Peeves could be legitimately dangerous. Hogwarts caretaker Argus Filch waged a constant war with Peeves, and year after year requested the poltergeist be thrown out of the school. Peeves further annoyed and bothered the Hogwarts community by joining in with whatever current gossip was circulating among students. When Harry Potter was suspected of being the "Heir of Slytherin" in 1992, Peeves taunted him in the hallways for "speaking in tongues." Students were known to allow Peeves to take the blame for their own mischief. Peeves did not heed commands from Hogwarts prefects or professors, though Headmaster Albus Dumbledore was an exception. The Deputy Headmistress, Minerva McGonagall, was probably another. The one Hogwarts ghost that struck fear in Peeves, in addition to controlling him, was the Bloody Baron. His fear of the Baron was so well known, that in their first year, Harry Potter, under his Invisibility Cloak, was able to drive him away by pretending to be the Baron. Overall, Peeves did not seem to care who he annoyed. If students were late to class, he would, among other things, drop wastepaper baskets on their heads, pelt them with chalk, or pull the rugs out from under them. The worst case involved him sneaking up invisible, grabbing the person's nose and screeching "GOT YOUR CONK!" However, Peeves was loyal to Hogwarts and proved this in the Battle of Hogwarts where he dropped Snargaluff pods on Death Eaters in mid-air, causing general chaos among their ranks, later showing evident joy when Voldemort was defeated. Though he never hesitated to prank them, Peeves appeared to genuinely like Fred and George Weasley. Peeves shocked everyone in 1996 when he actually listened to the twins' words, causing countless problems for Dolores Umbridge. As the twins left Hogwarts, Peeves saluted them in front of the student body. –Professor McGonagall sending Filch to find Peeves in order to assist in the defence of Hogwarts. Peeves and Argus Filch were sworn enemies for over twenty-five years. Filch never ceased his futile efforts to get Peeves banished from the castle, and Peeves never stopped taunting Filch. To annoy Filch, Peeves trapped Mrs. Norris in a suit of armour twice, dropped chandeliers and caused general mayhem, which Filch was later responsible for cleaning. It is presumed that this on going war between them continued after the Battle of Hogwarts. The Bloody Baron is the only being that Peeves takes orders from. Peeves has a large amount of respect for the Bloody Baron, for unknown reasons, likely because he is afraid of him. During his first year, Harry imitated the voice of the Bloody Baron to chase Peeves away so Harry could get around Hogwarts without Peeves in the way. Albus Dumbledore: "We need to find her. Professor McGonagall, please go to Mr. Filch at once and tell him to search every painting in the castle for the Fat Lady." Albus Dumbledore: "What do you mean, Peeves?" Apart from the Bloody Baron, Albus Dumbledore was the only being in Hogwarts who Peeves was known to have shown any respect for. In Dumbledore's presence, Peeves adopted an oily voice in an attempt to be polite to the headmaster, likely out of fear that Dumbledore could have him expelled from the school if he angered him. Peeves enjoyed taunting all the students and staff members of Hogwarts. Most people were infuriated by him but on one occasion Minerva McGonagall told Peeves that he was unscrewing a chandelier the wrong way when Peeves attempted to create as much trouble for Dolores Umbridge as possible. Peeves obeyed Fred's command to give Umbridge hell and caused her a great deal of trouble. Most of the students and teachers were on Peeves' side on this occasion due to their hatred of Umbridge. Umbridge had previously asked Minister for Magic Cornelius Fudge to sign an order for the expulsion of Peeves, but it is uncertain if he ever actually signed such an order, nor how the order could have been enforced had he done so. Peeves also happened to enjoy tormenting Harry Potter, Ronald Weasley, and Hermione Granger. He tried to get them in trouble with Neville Longbottom when he found them out of bed late in their first year, but was once beaten by them that same year (excluding Neville) when Harry impersonated the Bloody Baron, telling him to go away from the third floor so they could save the Philosopher's Stone without any interference. (Although, he was unaware of this). The next year, Peeves made a foolish alarm that Harry had Petrified two more people (Justin Finch-Fletchley and Nearly Headless Nick) and shouting that no humans or ghosts are safe. Peeves has directly clashed with other past Hogwarts caretakers, including Hankerton Humble and Rancorous Carpe. An attempt by Carpe to remove Peeves by luring him into a trap featuring weapons and trapping him with Containment Charms instead resulted in Peeves seizing the weapons and then subjecting Hogwarts to a three-day standoff. The standoff was only ended when then Headmistress Eupraxia Mole drew up a contract that granted him special privileges, including a once-weekly swim in the boys' toilets on the ground floor, first refusal on stale bread from the kitchen for throwing purposes, and a new hat – to be custom-made by Madame Bonhabille of Paris. Peeve means little devil or something that is personally annoying; a personal dislike (like a pet peeve). Peevish means disagreeable and bad tempered. According to J. K. Rowling's website, Peeves was "an indestructible spirit of chaos." Peeves has appeared in all of the books, but none of the films. A scene with Peeves was filmed for the film adaptation of Harry Potter and the Philosopher's Stone, but was left on the cutting room floor and to date has never even been released in any form, (even the Ultimate Edition box set). Peeves was played by Drop Dead Fred's Rik Mayall. According to Harry Potter Limited Edition, Peeves was conceived as having a consistently devilish grin, though there was a question of whether or not he would have hair. The only on-screen reference to Peeves occurs in the short film The Queen's Handbag, during which Harry Potter describes Peeves using the Queen's Birthday as an excuse to drop coloured eggs on Hogwarts students at breakfast. In the video games, Peeves is battled several times. For example, he randomly pops up out of boxes. In the PC game of Harry Potter and the Philosopher's Stone, Peeves is defeated with the Flipendo Jinx. In the PC game of Harry Potter and the Chamber of Secrets, he is defeated with the Ectoplasm-Cleaning Charm. In the PC game of Harry Potter and the Prisoner of Azkaban, he is defeated with the Rictusempra Jinx. Also, in the DS versions of LEGO Harry Potter: Years 1-4 and LEGO Harry Potter: Years 5-7, he is somewhat of a boss. Peeves was voiced by Chris Crosby in the Harry Potter and the Philosopher's Stone Video Game, Harry Potter and the Chamber of Secrets Video Game and the Harry Potter and the Prisoner of Azkaban Video Game. Although in the third book Peeves shows a bit of respect for Albus Dumbledore, it is noted in the fourth book that the Bloody Baron is the only one really able to control Peeves. Peeves is Oliver Phelps's favourite character in the Harry Potter series..
↑ Peeves is available in the "Downloadable Character Pack" DLC for the game. This page was last edited on 11 July 2015, at 08:38. This text is available under the GNU FDL and may have been adapted from the Wikipedia article about Peeves (history).